We are turning NBC into a cafe for the night! Come and hang out, listen to music, catch up with friends! Our two-week journey begins in Jordan exploring the lost city of Petra, viewing the promised land from Mt Nebo and encountering Amman. We will then travel across the Jordan River into Israel and to such places as Jericho, Masada, the Dead Sea, the city of Jerusalem, The Sea of Galilee and to so many more places that we encounter in God’s Word. We, along with local expert guides, will help deepen your understanding of the life & ministry of Jesus as we travel in the footsteps of God’s people of both the Old and New Testaments. Share in a wonderful experience which will leave you with insights & memories for a lifetime. View the full brochure and itinerary here. For more information, speak to Leon. Come pray with us. For revival, for our church, for the sick. All welcome! Come and go as you'd like, pop in for a minute or stay longer. We'd love to pray with you! NBC Youth is headed to KYCK again this year! We are really excited for the time away together enjoying the cool mountain air and hearing from God's Word! This year the talks are on the topic of 'Out of This World' from 1 Peter. KYCK is a Youth Conference held in Katoomba for 6000 students over 3 weekends. Our Youth will hear Bible teaching from John’s gospel. We will stay together in Katoomba and enjoy the fresh mountain air and each others company over the weekend! Find out more about it from kyck.kcc.org.au! (please don’t register for the conference on their website). We are attending the 1st weekend of Kyck from 12th-14th April. We will leave on Friday afternoon from Narrabeen Baptist Church at 5:00pm and return back to Narrabeen Baptist Church at 5:30pm on Sunday. $120. The conference itself is $73 per person and the rest of the money will be for accomodation and food. Extra money will be needed to buy dinner on Friday and Lunch on Sunday. Sponsorship is available is the price is a deterrent. And if you would like to sponsor another person to go to KYCK, please contact Daniel. If your family is sending more than kid, you will pay $120 for the first kid and $100 for every kid after that. Leaders will drive NBC Youth up to Katoomba and transport them around for the weekend. Leaders are at least Provisional 2 drivers and have been trained in safe practice whilst driving youth around (no red P-plates). Once you have filled in the form above ^^, please pay by direct debit or organise to give Daniel cash at church. Are you interested in reading and disussing excellent Christian books? Carolyn would love to see you at the book club on Saturday 30 March at 2.30pm at church! This month the book to discuss is ‘Heart of a Lioness’, the true story of ‘Mama Irene” Gleeson,: sacrifice, courage and relentless love among the children of Uganda. It’s an amazing read! Youth Mission Month: Junior Sleepover! During Mission Month NBC Youth is hosting Friday Night Youth events that are designed to attract kids for the first time to Youth Group! Our hope is that kids will come along and find meaningful community and a chance to think about God and Jesus more deeply. And we hope they will settle into our community for the long hall! An event we are hosting which achieves all these goals is the Junior sleepover. Giving kids a chance to grow closer to each other, spending more time together than the regular 2 hours on a Friday night. I know that for some kids (and parents) the idea of a sleepover can be a bit daunting, but I encourage you to come because it will be really valuable to feel at home in the youth community. If you’ve got concerns or questions, keep reading. If you still have concerns after reading this, feel free to contact Daniel (daniel.leach@narrabeenbaptist.org.au or 0448 326 699). If your child is unable to stay over the night for any reason, you can come and pick them up from church at 9:30pm. All the Youth leaders have working with children numbers, which means they are permitted by the government to work with people below 18yo. They have also participated in Safe Ministry Training called “Creating Safe Spaces” (https://creatingsafespaces.org.au), which has trained them in best practices with people under 18yo. The kids will be monitored during the night to ensure that they do not stay up all night, or attempt to sneak out. Bed time will be enforced. Boys and Girls will be sleeping in separate spaces during the night, and multiple youth leaders of each gender will be staying in the same spaces as their respective gender. If you have any further concerns or questions, please don’t hesitate to contact Daniel (email: daniel.leach@narrabeenbaptist.org.au or mobile: 0448 326 699). NBC Youth thinks it’s a privilege to partner with parents to make disciples of their kids with them. We only see their kids for a couple hours a week, while they live at home with their parents, making the parents the primary people who raise their kids in the love and knowledge of God. Join us for a very special women's breakfast. We'll be joined by International Justice Mission, the largest international anti-slavery organisation in the world. Hear the inspiring story of those redeemed from slavery and IJM's mission to free all victims and shut down slavery for good. Join women from Narrabeen Baptist Church for this illuminating and mobilising breakfast event. REGISTER: We have reached maximum capacity… registration is now closed sorry! PAYMENT: Please transfer $30 per person to the NBC Account and add 'WOMENSBF' and your last name to the description field. BSB 704 922, account 100 012 961. Summerkids is coming for January 2019! SummerKids is a free holiday activity club run through the organisation Scripture Union and Narrabeen Baptist Church. We are a small team of 50 young people and adults from around the Northern Beaches that have a passion for serving the community - specifically kids. We provide a safe, exciting environment for all kids aged 4-12 to enjoy at Lakeside Park, North Narrabeen, between 8:30am - 1pm each day from 2-4 January 2019. While they are with us they will be involved in lots of fun games, be provided with morning tea and lunch each day, and will hear the good news about Jesus in our very first Mini Olympics! Be sure to put on those runners and tighten them weightlifting belts for this iconic championship event, as we look at what it means to run the race of life with our eyes fixed on Jesus. Each of our leaders are trained in child safety and have all received Working With Children Checks from the NSW Office of the Children's Guardian. We also have a number of team members with current first aid! We cater for kids of all dietary requirements. Registration is free and will take place on the morning of each event day at 8:30am. If you have any questions, please contact the NBC Office. We cannot wait to meet you! 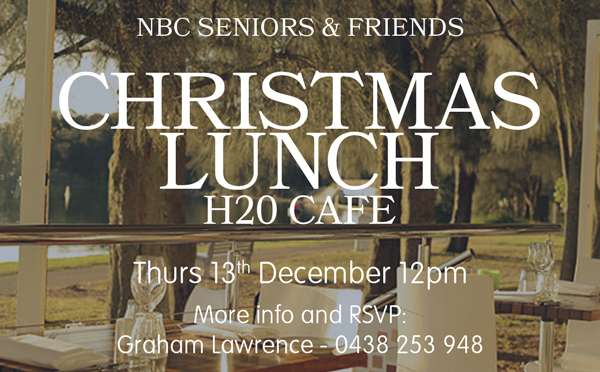 The NBC Seniors are celebrating the end of year with a lunch at H2O in Narrabeen. Please RSVP to Graham Lawrence - 0438 253 948. Come and enjoy an authentic Sri Lankan feast of curries, sweets and tea... hear about how God is moving in Sri Lanka from our friend Roy Francis... and have the opportunity to donate to the work of their local churches. Warringah Christian Bookshop will be at DeckTime with a bookstall on the 25th November. There will be a range of Bibles, Items for Scripture Teachers, Christmas Gifts and much more. All proceeds from the bookshop go to the Missions. Come and get your books and support this little light in Dee Why! This breakfast will be an opportunity for a group of blokes to get together over a great breakfast at Bayview Golf Club and think carefully about the issue of men and their mental health. We know how important and relevant this topic is and so we are excited to take this opportunity to be better equipped and educated. Thanks for registering below – we’re looking forward to seeing you soon. 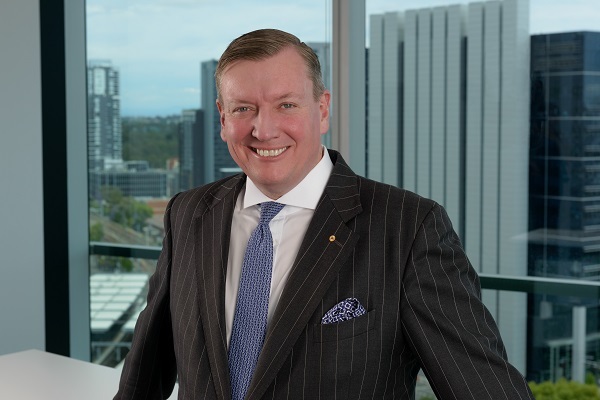 John Brogden has walked a very public journey of success, failure and redemption. From 1996 to 2005 John was the Member for Pittwater in the NSW Parliament. In 2002, on his 33rd birthday, John was elected Leader of the Opposition – the youngest person ever to hold the role and lead a major political party in Australia. From the highs of political leadership, through the lows of a suicide attempt and depression and into the business world, John has experienced the highs, lows and highs of life. John is a passionate speaker and an outstanding advocate for mental illness. He shares his experiences of depression and suicide with honesty and bravery and challenges the common misunderstandings of living with a mental illness. John is currently the Chairman of Lifeline Australia, Chairman for the Furlough House Retirement Village and a Director of Australian’s for Mental Health. REGISTER: Fill in the form below. PAYMENT: Please transfer $30 per person to the NBC Account and add 'MENSBF' and your last name to the description field. BSB 704 922, account 100 012 961. Thank you! Your registration has been received. We will get in touch with you closer to the event. Narrabeen Baptist Church would love to invite your family along to Lollypalooza, a Halloween event. On the 31st of October from 4:30-7pm, we are transforming the place into fun space for parents and kids 0-12 years old to come, play games, get lots of lollies, make crafts, get their faces painted, have a sausage or two and even watch a professional puppet show. And all of it is FREE! You don’t need to sign up, just come along and be ready for lots of fun. You can find us at 13 Grenfell Avenue in North Narrabeen. 4:30-5:45pm - Games, Activities and Craft Stations all open! 6:15-7:00pm - Sausage Sizzle and Games, Activities and Crafts resume! *Due to limited parking on Grenfell Avenue, we suggest parking on the surrounding streets or at either the Narrabeen Woolworths or Tramshed car parks. Join us for a fun, relaxed weekend to refresh together in Jesus Christ and the blessing of each other. "The Case For Christ" tells the story of an award winning journalist whose young wife declares that she has found Christ and he is certain he can "save her from her folly" and sets out to prove Christ does not exist. Join us for this movie in the auditorium at 10am. A light lunch will be available afterwards in the education centre. Please RSVP to Graham Lawrence by Tuesday 9 October - 0438 253 948. We all want to be happy. But we often find ourselves anxious, stressed, depressed, and miserable. The Bible talks about a kind of happiness that is deeper than simple smiles. It’s called Joy. And the Bible says we can have joy whatever our circumstances; anxious, stressed, depressed, or miserable. Come to camp to hear about this Joy from the Bible! As well as the Bible talks, there will be no shortage of good times with friends, water sports, beautiful beaches, great worship, encouraging stories, camping, and great food! TRANSPORT: We will be travelling up to Forster in leader's cars and in 2 Minibuses. Who would you like to share a tent with? NBC is hosting a night to think about the issue of Science vs God. Has science disproved God? How does a working scientist make sense of the supposed conflict between science and faith? Join us to hear from Western Sydney University Astrophysicist Dr Luke Barnes and then we’ll open the floor up for a question and answer time. He will discuss an astronomers view of the natural world, our attempts to understand it, and whether there is anything more than the universe we see. This will be a different presentation to last year and for those that heard him previously will know it's well worth your time. Please come with all questions you've ever wrestled through about Christian faith relating to science. It promises to be a great evening for all inquiring minds. Feel free to invite friends, all are welcome. Luke Barnes is a John Templeton Fellow at Western Sydney University. With a PhD in astronomy from the University of Cambridge, he has published papers in the field of galaxy formation and on the fine-tuning of the Universe for life. He is the coauthor with Prof. Geraint Lewis of "A Fortunate Universe: Life in a Finely-Tuned Cosmos", published by Cambridge University Press. NBC is passionate about equipping parents to do the hard work of parenting. Whether you are a parent, or hope to be in the near future, this event our upcoming parenting seminar is worth your while. Our speaker is Harriet Connor author of Big Picture Parenting. Discarding the guilt usually associated with parenting tips, her wisdom is gracious, thoroughly Biblical and wonderfully practical. You will walk away with tools to prepare for and enhance your parenting. The evening will also include a supper and time to chat with others as well as a Q and A panel. We understand that there may be a few of you who don’t have family nearby to help with baby-sitting. We don’t want you to miss out, so please contact Kieran (0422 734 830 or kieran.degan@narrabeenbaptist.org.au). Daniel Leach and James Dawson are taking a crew of NBC's next generation away to equip them to take the good news of Jesus to the world. We think there's nothing more valuable than equpping the next generation to love and follow Jesus, so we can't wait for this weekend. It's going to be an excellent time to get away from the hustle and bustle, hear from God, worship him together, get trained, and have some quality times with your Christian family. It's completely free if you are at NBC. Maybe, can I hear more about it? What does it mean to live as a Christian in the sexualised world of today? Can we bring God’s view of gender, relationships and marriage to a world which screams out the message that every desire must be met – whatever the consequences? Patricia looks at what the Bible teaches us about sexuality and relationships, and applies it to life. Dr. Patricia Weerakoon is a Sexologist and Writer. She trained in medicine in the University of Sri Lanka. She is married to Vasantha and her son Kamal is a Presbyterian minister. Patricia retired in 2011 after a twenty three year career as an academic with the Faculty of Health Sciences of the University of Sydney. The last eight years of which she was the director of an internationally acclaimed graduate program in Sexual Health. This is seminar for you whoever you are. Are you a teenager? Engaged to be married? Long married? Single? Come and be challenged. Here is a sample of Dr. Weerakoon's teaching, or you can listen to the Parents Seminar she did for NBC in 2017 here. Membership. What is it all about? What's in it for the church? What are the benefits to me? What does the bible have to say about it? Come along to our membership information session and speak to our pastors and elders about what it means to be a member of NBC. This is a dinner for all primary aged kids and their parents. It will run after our Kids' Arvo program. For more info contact Kieran on 0422 734 830 or kieran.degan@narrabeenbaptist.org.au. 23 August - Week 7: So What? Fill in the form below to be a part of it! It's ok to come along once to see if you are comfortable. 22/6 Week 7: So What? We’re running a fellowship event for NBC and we’d love for you to be a part of it. WHAT IS A LIVING BOOK? When we go to a library, we borrow a book. But what if we could go to a library and ‘borrow’ a real person who tells us what would otherwise be written in that book. In a small group, with an audience of 3-4 people sitting together, one person shares a 10 minute story of an aspect of their life with their audience. The audience has 5 minutes to then ask questions of their ‘book’. ‘Living Books’ are where the books are real people with real life experiences. We’re hoping it provides an opportunity for individuals at NBC to connect with people they may not know well. We hope it will allow us to better understand the life experiences of others. It provides an organic environment and encourages active and engaging conversations so that people can develop a greater understanding of each other’s stories. See you 4pm in the Education Centre at Narrabeen Baptist Church.